Christians never argue the wilderness private-vision criteria of Matthew 24 to defeat Mormonism. See this link for our discussion on how the 'false prophet' point is argued by normative Christian evangelicals against Mormonism. They never cross that line to raise the obvious wilderness private-vision test which Jesus gave us. These apologists for our faith deliberately hamstring themselves for, evidently, to mention this issue would simultaneously implicate Paul as following a false Jesus. Hence, they keep quiet about the clearest criteria that refutes the Jesus whom Joseph Smith met was the true Jesus. “Wherefore I give unto you that ye may now translate it [the New Testament], that ye may be prepared for the things to come. “For verily I say unto you, that great things await you” (D&C 45:60–62). Joseph Smith artfully made all these prophecies about "false Christs" in "his name" become limited to "Jerusalem" and the "Jews" by adding those terms as limiters which are not present in the same verses of the true Matthew 24. (See Matt 1:18, 1:21, of the Joseph Smith Matthew). What is the result? If you believe in the Book of Mormon, the Galilean Jesus's warnings in Matthew 24 have become so narrowed that they only apply to "Jews" and "Jerusalem," and thus cannot apply in the North American continent where Joseph Smith had his encounter. 12 When you, therefore, shall see the aabomination of bdesolation, spoken of by Daniel the prophet, concerning the destruction ofcJerusalem, then you shall stand in the dholy place; whoso readeth let him understand. 26 Wherefore if they shall say unto you, Behold, he is in the desert; go not forth: behold, he is in the secret chambers; believe it not. Matt 24:23-26. KJV. Obviously Smith added in 24:24 "who are elect according to the covenant" to erase the possibility that any Mormon was deceived by anyone. That is ambiguous in how the true Jesus said "if it were possible, they shall deceive the very elect." Jesus was warning the 12, so evidently it applied to them equallly. The ambiguity is resolved in context as making it possible for a Christian to believe the false prophet. But in the Mormon edition, this is erased as even a possibility at all for a Mormon. Hence, the warning is utterly erased for a Mormon while a Christian must accept the passage is ambiguous, and in context indeed warned Christians have to be on guard from false prophets as much as anyone. Thus, if Joseph Smith was so desperate to deflect Matthew 24 that he made material alterations to deflect its application to himself, we should as Christians be willing to throw it back at him. We need to say Smith's Jesus was deceiving Smith to remove the very criteria that would prove to Smith that his Jesus was false. But no Christian will presently say this because to do so will expose Paul to the same Berean-examination, and this is not tolerable to anyone yet. How Do Scholars Obscure Matt 24 or Luke 17? Immediately after this [in Luke 17] comes the warning to the disciples. They will be urged to 'Look here,' and 'look there,' for some purely historical Messiah, but they must not allow themselves to be led astray because Jesus will return as a flash of lightning. Similarly in Matthew: if people point to a Messiah in the desert (where so many Jewish leaders assembled their troops) or hidden in houses (as indicated in many legends) 'do not believe them.' This is followed by the metaphor of lightning. So you see, it is right in front of the scholars. But they will not articulate it in a way the reader would cast his mind across the story Paul delivered, and then be aided on how to apply Jesus' words to Paul's encounter. So indeed, Samuel heard the voice of God, revealed it to his own father but did not know the Lord God at the very same time. This is how one can prophesy in Jesus' name but not actually know Jesus. You can hear an extra-mental voice, and not know God. One hearing the voice must use God's prior self-revelation through verified prophets to test whether the voice you hear is truly from God. Do not forget that Satan likes to patrol the wilderness, and it is there Satan met Jesus to tempt Him. Furthermore, while we generally associate the wilderness today with a good-time to see natural wonders, in the Mosaic era, it generally meant a dangerous place, typically without food or water, and subject to evil robbers intent on killing you for your money. So a wilderness had a negative connotation. Hence, Jesus went to the wilderness as a test of himself, knowing the threats it might entail. In Moses' day, God rejected Israel and let them wonder in the wilderness for 40 years as punishment before letting them take the promised land. See Numbers 14. In the wilderness, there was also Korah's rebellion which sought to incite the people to no longer heed Moses. Numbers 16. Atonement by incense caused God to relent in His punishments. And elsewhere in the Bible, the wilderness becomes a place of rebellion as in Psalm 106 and Ezekiel 20.10-26. In the same vein, John the Baptist also lived in the wilderness where John invited men to come and hear his message, repent, and be baptized. For the listeners, it was a moment of decision in the wilderness, for or against God. Prior to the Damascus Encounter Had Paul Committed the Unpardonable Sin? Paul confesses to us that prior to his call, he was guilty of "blasphemy." (Blasphemy is an insult of God.) Paul insists he received mercy because he committed blasphemy "ignorantly in unbelief." 1 Tim. 1:12-13. Jesus taught us the Pharisees by attributing His miracles to Satan had insulted the Holy Spirit, and committed the unpardonable sin. It is clear that they did not intend to insult God but it had that unintended affect. Thus, it is quite possible or likely Paul already committed the unpardonable sin prior to his encounter. If so, God could not have chosen Paul anymore to lead others for Christ. In an online version dated to 1805, we see Lyttlelton only addresses seriously three possibilities on how to interpret what Paul experienced: 1. it happened as Paul said; 2. it was the product of an "overheated imagination" or 3. "he was deceived by the fraud of others, and all that he said must be owed to the power of that deceit." (Id., at 11.) Lyttleon claims he is trying to bring "out all possible lights" to consider the verity of Paul's experience. However, Lyttleton near the end admits he has consciously omitted the one possibility that I contend fits Paul's self-sacrifice of comfort and career: Satan was the imposter light -- the angel of light himself. "To impute them [i.e., the appearance of the light and voice] to magic, or the power of daemons...is by no means agreeable to the notions of those who in this age disbelieve Christianity. It will therefore be needless to show the weakness of that supposition." Page 102. May I suggest Lyttleton knew that was a problem. Thus, he was afraid to address it. So he simply dismissed it as unnecessary to address, claiming that since no one who "disbelieves in Christianity" raised it, Lyttleton does not have to answer the question. Lyttleton serves to prove other than the Satan-explanation, no other explanation fits all the facts. Why else would supposedly Jesus choose an unrepentant "blasphemer" and "violent man" (as Paul admits in 1 Timothy 1:11-12) guilty of the murder of Stephen and "breathing murder" as Luke describes him (Acts 9:1) to be even his witness? Why else would that chosen-witness prove sincere and zealous for Jesus but also become clearly apostate on the Law while systematically contradicting almost every doctrine of Jesus (see "Paul's Contradictions of Jesus")? So Lyttleton helps indirectly to prove the truth. Indeed, Paul had no financial motive to lie and become an agent of an imposter himself. Paul was instead accepting the dangers of being an apostle of Jesus. He sought no worldly power. To lead "sheep" heading for the slaughter was not a sufficient motive to lie. Hence, no self-interest existed, and therefore no intent to be an imposter fraud himself was present. Lyttleton is correct on all points. In passing, Lyttleton shows he supports viewing Paul as not teaching faith alone justification. Lyttleton cites Paul's verses on fearing he will be a "castaway" and this proves that "absolute predestination" or other justification doctrines was not in his mind. Id. at 25 citing 1 Cor. 9:27. This partly explains why Lyttleton wishes to protect Paul. Lyttleton does not accept Paul taught faith alone, predestination of the lost, or eternal security. Hence, Lyttleton does not recognize the contradictions of Jesus' doctrine which everyone else sees and advances in modern Protestantism. Lyttleton then mentions Ananias. Supposedly Jesus' funnelled his message through Ananias to Paul. But Lyttleton admits Ananias is not mentioned before or after in Acts. He is a complete unknown. Lyttleton argues this is to Paul's credit, for then Paul did not conspire with Ananias if there was no earlier or subsequent contact. Id. at 43. Yet, Lyttleton does not ask whether Ananias was equally deceived by an imposter such as Satan. Why should we trust Ananias who had no reputation that we know of in the church itself? On page 62, Lyttleton moves on to the issue whether Paul had an overactive imagination. First, he mentions the issue, but then quickly resorts to proving Paul was not a deliberate fraud because who would take the risks of fraud to gain grief and persecution. Then on page 73, Lyttleton finally turns in earnest to the issue of whether Paul had a heated personality that might imagine the event. Here, Lyttleton fails to win his point that Paul did not suffer from self-conceit. See page 79. He quotes Eph. 3:8 that Paul calls himself the "least of all saints." Lyttleton tries to argue away 2 Cor. 11:5 where Paul says he is not a "wit" behind the leading apostles. But Lyttleton does not do an effective job. Lyttleton says Paul's apostleship was in question, and this response was supposedly proper. No! Humility and proof was what was necessary, not arrogance. But I would say Lyttleton is correct in the sense that Paul would not from even just pride claim to be a follower of Jesus as an apostle in that era ... it was a liability for the most part. Here we see that "signs and wonders" enter into the proof, which Jesus disqualified as evidence. What Lyttleton does not address is if Paul met the true Christ, why did Christ have to speak through Ananias? Why not directly? After all, that will supposedly happen later. Wouldn't the key mission come from Jesus, not a third-hand source? Lyttleton instead thinks Ananias' role helps Paul when in fact it undermines this was truly Jesus whom either men spoke with. Then Lyttleton says how can we believe Paul was defrauded by Ananias when Paul had such success in "converting the Gentile world." (Pages 92-93.) Again, the real issue is not about Ananias or Paul's 'success,' but about whether this was Jesus talking to Paul OR Ananias. Ananias disappears from view, never a co-laborer with Paul when one would think naturally Paul would stay with the person who relayed Jesus' first words on what Paul's mission was supposed to be. Wouldn't someone miraculously in contact with Jesus' revelations be someone you want to stay connected with? But nothing is ever spoken about Ananias again. Lyttleton emphasizes again that it is hard for nonbelievers to explain Paul's "success." (Page 93.) But if this were the false Christ whom Paul met, Paul's success, which included popular "demonic"seers (the Python priestess at Philippi) promoting Paul, would not be that hard to explain. This is getting closer to asking whether Satan was involved, but falls short. To believe the apostles were involved requires us to ascribe dishonesty to them. So we know where this issue will go as long as Lyttlelton restricts the issue to whether Paul was defrauded by holy men. We will naturally reject that. As Lyttleton says: "it was morally impossible for disciples of Christ to conceive of such a thought." (Page 100.) Nor could they produce a light in the air, etc. "Beyond dispute, no fraud could do these things; still much less could the fraud of others produce those miracles subsequent to his conversion, in which he was not passive but active." (Page 101.) Therefore, the "Christian religion is a divine revelation." Id. Thus, anyone can see Lyttleton is ignoring the key question: was there someone like Satan who could do signs and wonders like the light and blindness involved in the Damascus encounter who defrauded Paul? We also were told by Jesus that healings in Jesus' name do not suffice to prove you ever "knew" Jesus. (Matt 7:21-23.). Paul could use the name of Jesus to heal. For Jesus said a lost man can heal using Jesus' name; Jesus says that His name is that powerful, and that healings will occur in His name by those "who do not know" the true Jesus. (Matt 7:21-30). Lyttleton's concluding remark proves he did not know of those passages, or at least did not want to mention them if he did know of them. Having eliminated all human fraud upon Paul, Lyttleton concludes: "It therefore must be accounted for by the power of God." Id. at 102. He refers to this as "God...work[ing] miracles for the establishment of a most holy religion..." Id. at 102. "To impute them [i.e., the miracles] to magic, or the power of daemons...is by no means agreeable to the notions of those who in this age disbelieve Christianity. It will therefore be needless to show the weakness of that supposition." Page 102. In other words, Lyttleton says he need not address whether a demon performed the encounter at Damascus. Such a notion is not "agreeable' -- advanced / suggested -- by opponents of Christianity. Therefore Littleton says he does not have to address the question. But what about a Christian's duty to advance the issue in obedience to our Lord's warnings? Just because our enemies do not suggest it, does not mean we do not have a duty to raise it. Interestingly, Lyttleton tells of Lucian's account of Alexander of Pontus. He sought to spread a world religion from that city. See page 66. This may bear more scrutiny in the history of Marcionism which began at Pontus. Anyone Else Ever Connect Jesus' Wilderness Warning To Paul? There does not appear to be any scholarly book ever written that has asked whether Paul's wildnerness encounter is directly put in doubt by our Savior's words in Matthew 24. A google "books" search with the term "every eye" (to connect Matt 24) and "Paul Damascus wilderness" turns up 4 cites (including our website), but none of those other 3 deal with this issue. See this link. However, there are several web-articles that do raise the question. NYC Bible Study does so at this link. Eskimo in a blog article "Was Paul a False Apostle" did so in June 2010. Also, CW in his Questioning Paul in chapters 4 and 12, excerpted in our website review raises the link. [Matt 24:24-27- quotation] If people accept that Jesus spoke Truth, only then the answer to Paul's question is NO ... he has NOT seen Jesus because Jesus said nobody would see him in a localised place. Jesus warned that anybody who says they have seen him is to be avoided i.e., GO NOT AFTER THEM NOR FOLLOW THEM!!!! What is astonishing to me is that ONCE you see the issue, you cannot get rid of it from your mind because it is 100% on point. Then you wonder how centuries of Christians missed it. It is a puzzle. One theory is that it was seen, and then suppressed. Or that Satan has blinded us all these centuries. God sent warnings but we do not listen. But if there is eventually a discovery of an early-church reference, then we will know the thought was simply not repeated and consequently forgotten. These comments from David Whitmer regarding the loss of the "Interpreters" and Joseph's subsequent use of his stone, help clarify some confusion regarding what exactly Joseph used to produce the Book of Mormon. When Joseph first announced the discovery of gold plates with strange engravings, he also claimed there were special spectacles called "Interpreters" that were with the plates. Joseph said these were to help in the translation process. However, after Martin Harris lost the first 116 pages of the Book of Mormon translation that Joseph loaned to him, Joseph claimed that the angel took back both the plates and the Interpreters as punishment to Joseph. He would later get back the gold plates, but was told he would not receive the Interpreters, but instead was allowed to use his seer stone to produce all of the Book of Mormon we have today. As time went on, Joseph Smith and others would refer to the seer stone both as "Interpreters" and as the "Urim & Thummim. Id. Although Mormon historian B. H. Roberts claimed that Joseph Smith used the Urim & Thummim, he frankly admitted that he sometimes used a "Seer Stone" to translate the plates: "The Seer Stone referred to here was a chocolate-colored, somewhat egg-shaped stone which the Prophet found while digging a well in company with his brother Hyrum,... It possessed the qualities of Urim & Thummim, since by means of it - as described above - as well by means of the Interpreters found with the Nephite record, Joseph was able to translate the characters engraven on the plates." (Comprehensive History of The Church of Jesus Christ of Latter-day Saints, vol. 1, page 129) Id. It should be noted that the mention of the Urim & Thummim in Doctrine and Covenants 10:1, dated "summer of 1828," was written back into this revelation at a later date. In its original form as Chapter IX of the 1833 Book of Commandments, the revelation makes no mention of the Urim & Thummim (scanned image of 1833 Book of Commandments, Chapter IX and D&C 10:1). The mention of Urim & Thummim in what is now designated D&C 10:1 first appears in the 1835 edition of the Doctrine and Commandments, where it is found as Section XXXVI. By aid of the Seer Stone, sentences would appear and were read by the Prophet and written by Martin, and when finished he would say ‘written;’ and if correctly written, the sentence would disappear and another appear in its place; but if not written correctly it remained until corrected, so that the translation was just as it was engraven on the plates, precisely in the language then used (CHC 1:29). Did anything about that passage stand out to you? Follow up with a discussion about the seer stone. “The manner in which he pretended to read and interpret, was the same as when he looked for the money-diggers, with a stone in his hat, and his hat over his face, while the Book of Plates were at the same time hid in the woods” –Isaac Hale, father of Emma Hale Smith, in an 1834 affidavit. “When Joseph was translating the Book of Mormon [I] had occasion more than once to go into his immediate presence, and saw him engaged at his work of translation. 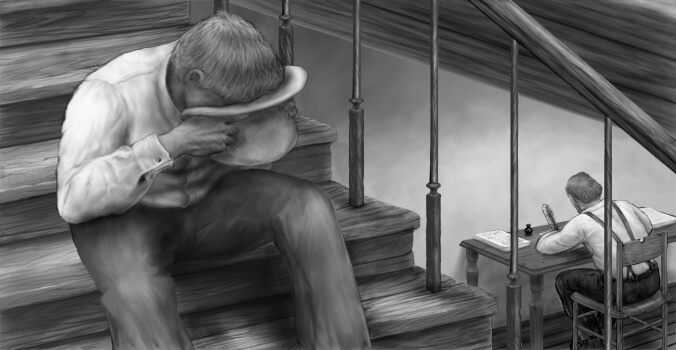 The mode of procedure consisted in Joseph’s placing the Seer Stone in the crown of a hat, then putting his face into the hat, so as to entirely cover his face, resting his elbows upon his knees, and then dictating word after word, while the scribes – Emma, John Whitmer, O. Cowdery, or some other wrote it down” –Michael Moore, Emma Smith’s brother-in-law. “Now the way he translated was he put the urim and thummim into his hat and darkened his eyes then he would take a sentence and it would appear in bright roman letters then he would tell the writer and he would write it then that would go away the next sentence would come and so on. But if it was not spelt rite it would not go away till it was rite, so we see it was marvelous. Thus was the hol [whole] translated” –Joseph Knight, Sr. (spelling preserved from original). “The Church’s Historical Record records Joseph’s use of the seer stone to translate all of our current Book of Mormon text” . Will you study this pamphlet/website and pray about whether the things it says are true? This was 1822 when Smith was 16. So in accordance with this, my determination to ask of God, I retired to the woods to make the attempt. It was on the morning of a beautiful, clear day, early in the spring of eighteen hundred and twenty. I kneeled down and began to offer up the desires of my heart to God .... I saw a pillar of light exactly over my head .... When the light rested upon me I saw two Personages, whose brightness and glory defy all description .... One of them spake unto me, calling me by name and said, pointing to the other 'This is My Beloved Son. Hear Him!' .... I asked the Personages who stood above me in the light, which of all the sects was right, (for at this time it had never entered into my heart that all were wrong) and which I should join. I was answered that I must join none of them, for they were all wrong .... I soon found, however, that my telling the story had excited a great deal of prejudice against me among professors [believers] of religion, and was the cause of great persecution, which continued to increase; and though I was an obscure boy, only between fourteen and fifteen years of age ... yet men of high standing would take notice sufficient to excite the public mind against me, and create a bitter persecution; and this was common among all the sects all united to persecute me. — Pearl of Great Price, Joseph Smith - History 1:5-8, 14-19, 22. See New Light on Joseph Smith's First Vision. The product of this angel Moroni's effort was a Jesus who has many doctrines that contradict the Jesus of the twelve apostles. As a result, many true Christians cite Matthew 24:4-5 to prove the Jesus of Smith's vision in a "pillar of light" and later seeing the angel Moroni gave Smith an imposter Jesus, although not as capably as they could have. (See Imposter Analysis Applied to Mormonism.) Mormons are sincere in their faith that they are truly following Jesus Christ. But many Christians contend that these Mormons are dupes of a fraud perpetrated by the personages in the Pillar of Light and the Angel Moroni upon Joseph Smith to follow an imposter Jesus. Making such a test about whom spoke to Smith in the wilderness is not unkind. It is Biblical to make such a test. Although this appears in the front of every book of Mormon, Mormons do not apply Matthew 24:4-5 to test their hero. Why is that? Two reasons. First, the Jesus of their dispensation does not rely upon the words of the dispensation to the 12 apostles of Galilee. The Jesus of Smith's revelation said Galilean Christianity as handed down had it all wrong. Even their Mormon scriptures allude to supposed error in our scriptures. In its First Nephi 13:26, we read: "... a great and abominable church which is most abominable above all other churches; for behold, they have taken away from the gospel of the lamb many parts which are plain and most precious..."
So they put no absolute trust in the words of Jesus in the Gospels. They judge by feelings. But we do not rely upon feelings. We rely upon Jesus' words in the Gospels to test Joseph Smith. And we apply the same Biblical tests to Paul which Paulinists apply to Mormons. The result: we come up with the same conclusion about Paul that they do about Joseph Smith. 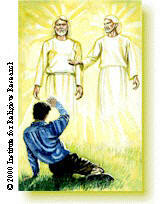 Paul and Joseph Smith both met an imposter Jesus in the wilderness who came out of a pillar of light. I reread Paul truly met Jesus on the Road to Damascus and am amazed at the amount of research and information you have put into it. I've brought up this topic at my bible study class and everyone there remains speechless whenever I tell them Paul is the false prophet of Matthew 24. Anyway, I will refer this article to them and hopefully they will realize the truth. Ed. (10/1/2013). Hello Douglas, this is Naftoli again. I was glad that you found my comments on Habbaquq worthy of mention; I often mention your site to many of my Christian friends with whom I work. In that vein, I thought to share another peculiarity in the Old Hebrew Matthew that coincides with this article concerning Paul's wilderness vision. verse 24:26-28 "Lakhen im yomeru lakhem 'Hu khazah ba'arav', al teitzeu; ki kaboqer (KBQR vs KBRQ) hayyotzey mimmizrakh umeir ad ma'arav kein yihyeh bo'o ben-ha'adam. Bammaqom shehaggeviyyah nimtzeith, sham yiqqovetzu hannesharim." There are several word-plays here. It reads thusly: "Should they say to you, 'He has been seen in the desert', do not depart; for as the dawn departs from the East and shines until the West, in the same manner shall there be a manifestation of the Son of Adam. In the place wherein the living body is discovered, there, there is the swarming together (as a pack encircles it prey) of the Eagles." Here there is a likely insinuation of the coming of a call to 'depart', which almost always refers in Hebrew literature to a parting of ways from a former association. Then Yeshua continues by saying how this would come about; that there shall be a 'sighting' by someone, seeing a manifestation that says that he is the Messiah (falsely), and will teach a different message. Moreover, that this 'sighting' shall be in the 'desert' which is a word play with the word for the 'West'. Here Yeshua is foretelling what oral tradition within Judaism would go on later to record and still state, that Roman Christianity is the Kingdom of Edom, wherein the Gentiles who have heard of HaShem must 'wander in the wilderness/desert' before coming to their 'promised land.' He is foretelling the destruction of the Jewish remnant and the usurpation of the office of 'G-d's chosen people'. This fulfills the word of the Torah in Genesis, concerning Esau, found in the mouth of Isaac. Lastly, the wording of BoQeR rather than BaRaQ (an obvious scribal error attested to by the Old Syriac as well, as 'Lightning' is a very problematic choice for that which shines from the East to the West whereas 'Dawn' is an obvious fit. ), alludes to the infamous 'Lucifer" passage in prophesy.... In a nutshell, the Hebrew is quite damning for Paul's case, hence why translations were readily made into various other tongues so that the Hebrew might be supplanted and denied though it has been in existence for 1,980 years. George Reber, The Christ of Paul (1876) writes in chapter V: "But Paul himself had not seen Christ, except under such circumstances as might excite suspicion of either delusion or fraud." Interesting information ... but my question is why would Satan compel Saul to stop killing Christians? Would not that be dividing his kingdom? Henriam. You say "Satan compelled Saul to stop killing Christians." Well, this is not exactly correct. The voice Paul met never actually condemned Paul's killing Christians. He said: "Why do you persecute me?" In fact, don't you think those words odd if this were the true Jesus? that this Jesus did not also criticize Paul for murder? right? This Jesus simply asked a question about persecuting Jesus, with no effort to guilt or shame Paul for the unjustified killings and blasphemies Paul had uttered previously. But the true Jesus had no trouble condemning other Pharisees in harsh words for leading people astray and leading them to death. So the point you raise, when critically examined, is actually a factor why Paul's encounter was not with the true Jesus. This figure did not try to lead Paul to repentance, scorn him as a murderer, and simply asked a question about persecuting Jesus. Further, Jesus warned of those coming who would kill and who would be imposters. Satan can use either strategy. To pull off the trick of an imposter duping someone, he has to say and do things that for the most part sound like the true Jesus would say. Yet, as we see, not entirely here, for unlike the true Jesus, the Jesus on the Road to Damascus virtually gives Paul a pass for his prior murders, and does not try to shame Paul, or explain why Paul deserves any kind of commission as a "witness" of Jesus' resurrection. So the more we look at this passage, the more and more clear it is that our Lord warned us of the Jesus whom Paul met on the road to Damascus.